It seems like only yesterday, he was sitting behind the wheel of that old fashioned car that drives along a track on the Ocean City Boardwalk. But in the blink of an eye, he's sitting in MY driver's seat of MY car, with a learner's permit in his hand. I have to admit, this milestone took me by surprise and I was NOT ready to help my teenager learn to drive. 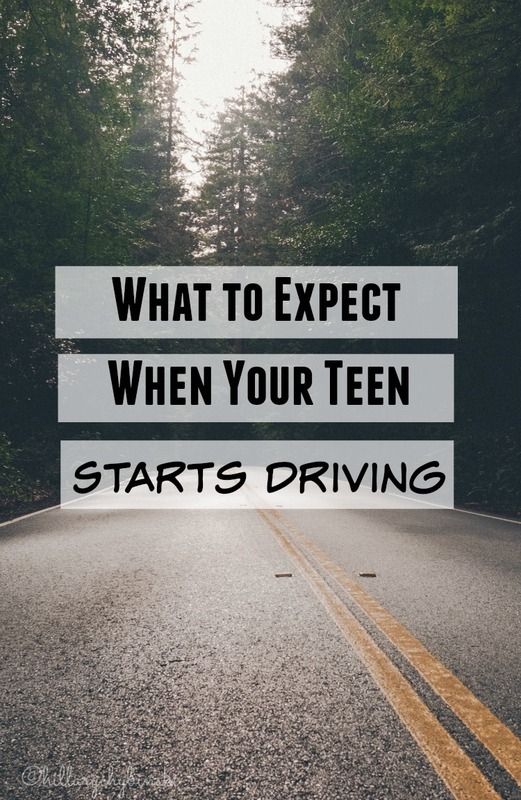 To help prevent that from happening to you, I'm here to share what to expect when your teen starts driving. First of all, the laws vary by state, so as your teen celebrates their 15th or so birthday, it may be a good idea to find out what the laws and requirements are where you live. In our state of PA, you need to be 16 to get a learner's permit. What I didn't realize was that you needed a doctor's exam as well, and our annual well visit crossed paths with our 16th birthday celebration. My bad. Once your teenager has their permit in hand, it's time to slide behind the wheel. I was completely freaked out thinking about my teenager driving. Drivers are AWFUL out there on the roads. I was fortunate to have an amazing defensive drivers education course as part of my high school curriculum. It included simulated driving, lectures and written exams and behind the wheel experience. My parents didn't have too much to do to help me get prepared for my actual driver's test. We do not have anything like that is our school district, and learning to drive falls squarely on the parents' shoulders, or a paid driving instructor. And paid driving instructors aren't cheap. Based on my research so far, they average about $50/hour (you need six hours for an insurance credit). There's a program called Tire Rack Street Survival in our area. This is a non-profit that teaches teen drivers safety skills. Once we get a little more skill under our belt, I'm going to look into that. When my teen got his permit, we received a book from the PA Department of Transportation, The Parent's Supervised Driving Program. Each lesson concentrates on a particular sequential skill. The book is available in PDF format, comes with a compatible App and includes a driving log to record supervised driving time and conditions. So in between practices, and around our already busy life, we are working through this. We are moving at a much slower pace than he would like, but there's no real rush, right? Once you've completed your state's permit requirements, it's time for the test. Here in PA, I learned that kids schedule out about six months in advance . . .it really fills up and finding a testing date can be a challenge. Know your options for where you live. I really can't stress enough to find out as much as you can ahead of time, to avoid conflicts and delays. For us, the parallel parking portion of the driver's test is first, and if kids don't pass that part, they are let go to schedule another testing date. Do you think your attitudes and input affect your teen driver? According to a recent study by the University of Alabama at Birmingham, they do. I found this to be very interesting, as we are taking this process very slowly. Have you taught your teen to drive? What resources have you found to be helpful? Great information for those of us traversing this crazy milestone! Thanks for the helpful information. I still have a little over a year until we get to this point, but it will be here before I know it! Great post. I am surprised (not sure why) at how much difference there is between states. In Florida, you can get your permit the minute you turn 15, driving experience or not, based on a written test. Then 365 days after that, you can get your license, with a driving test (but my younger, who had taken drivers' ed, had the driving test waived because of that). Given the kinds of errors my daughter made as a new driver, I wished I had made her take driver's ed --- there's just something about a third party teaching you (IMO). My son did an abbreviated Driver Ed camp but even that set my mind at ease. Our sheriff's association also does an awesome Teen Driving Challenge (it's a day long) where they teach them lots of defensive driving, including a specially equipped car where they learn to spin out (which, granted, is not as big a need in FL as it is up north). Anyway, wishing the best for your kiddoes.